There’s a lot of junk in Albany. That’s not a slam against the city, it is just a statement of fact. Actually, you could name any city in the country and make the same statement: There is a lot of junk. Most of the junk in Albany is kept on the inside of a home. It might not be the kind of junk you would associated with a junk yard. These aren’t items that are rusting or decomposing. But if you have an old sofa or futon that you don’t want to keep, then it is junk. The same can be said for any other item of clutter that is taking up space in your home. Once something has crossed over into the “junk zone” you’ll want to get rid of it and the best way to handle that is to bring in the professional junk haulers from Junk King Albany. The reason Junk King gets to call itself professional starts with the type of workers that hire. Every junk removal session will be staff with at least two capable moves. This is the team that is going to do all the actual heavy lifting work for you. That means they have to be some level of strong. They also have to be problem solvers. It takes some ingenuity to maneuver furniture and other bulky items down staircases and hallways without scratching up walls and floors. Those are all the technical skills that Junk King workers possess but they also need to have a positive attitude. You should feel comfortable inviting these workers onto your property. Junk King takes a professional approach to pricing, too. Their pricing fees are based on how your stuff will fit onto the back of the truck. These junk haulers can look over any random assortment of junk and know how to pack it tightly onto the truck. The less room they use, the less you’ll be paying. You will never be overcharged because something has been deemed too heavy. The list of things you want Junk King to haul away can be a long one or a short one. Whatever you want to get rid of will be their priority. For the best professional junk haulers in Albany, look no further than Junk King Albany. This entry was posted in Albany Junk Removal and tagged junk haulers, Junk King on July 31, 2018 by Junk King. Last updated July 31, 2018 . The question everyone is asking these days is, “What happened to the summer?” Yes, there are still a few weeks left before school starts and the calendar official switches over to “fall” but it still feels like the summer is racing by. Doesn’t it always feel that way? Have you accomplished all you wanted to get done this summer? Now is the time to knock out those tasks from around the house so you can really enjoy the rest of the summer. First up, a big midsummer cleaning with help from Junk King Albany. Junk King Albany isn’t the kind of cleaning service that sweeps and dust. However, when their service is over, your home will be truly transformed. That’s because all the things you have been wanting to get rid of but couldn’t put in the trash can finally be gone. Junk King is going to provide a strong moving crew for your session and that is the perfect team for clearing out old sofas, mattresses, baby furniture and appliances. But that is just the beginning of what Junk King can clear out for your midsummer cleaning. What kind of things do you have in your closets or out in the garage that you’re never going to use again? All of those items can be turned over to Junk King as well. Think of how great it will be to find the outfits you’re looking for in your closet without shifting through all those old clothes. And when you need to pull down those seasonal decorations, you won’t have to fight through all that unwanted clutter. The best part about hiring Junk King is what happens when they’re long gone from your home. This is when they sort through all the things they’ve collected to see what can be donated or recycled. Yes, some of the things that Junk King takes in are going to be considered genuine trash but all the rest can be repurposed and kept out of the landfills. That is a much better approach to junk clearing then just dumping trash. 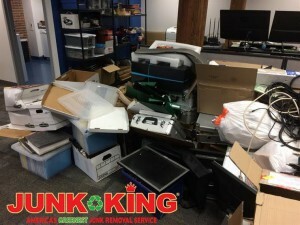 You can still make an improvement around your home this summer by hiring Junk King Albany for some serious junk clearing. This entry was posted in Albany Junk Removal and tagged Junk King, junk removal, midsummer cleaning on July 22, 2018 by Junk King. Last updated July 22, 2018 .